Fiona Curran is a Lecturer in Filmmaking at Kingston University and is a poet, as well as a sonic artist & experimental filmmaker. She holds an M.A. in Creative Writing from the University of East Anglia. 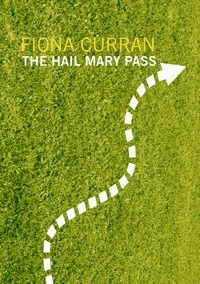 As a poet she has been published widely in the UK & Ireland, most recently in The Wolf, Magma, Bare Hands, Textsound and Phonographies, and her first poetry collection The Hail Mary Pass, was published by Wreckingball Press. Eyewear Press will publish a second collection, as yet untitled, in 2015. She reads/performs her work nationally. As a sonic artist (moniker 21%) she has presented sonic works at the RedSonic Festival, Car Boot Art Fair, and at The Literary Kitchen. She has also presented her poetry on Resonance FM. She has recently begun to explore soundscaping connecting to poetry through the use of film and has a particular interest in the ideas around sonic/poetic portraiture and notions of essence. Her work has been published in Aesthetica, Antiphon, Bare Hands , The Committed, Ekphrastia Gone Wild, Envoi, Interpreters House , Magma, Obsessed with Pipework, Orbis, Poetry Nottingham, The Slab, Stand, South Bank Poetry, The Shop, The Reater, Textsound, Wayfarers , Wire, and The Wolf. She has appeared on Cursive Script (a podcast from Kingston University), Phonographies, and Resonance FM.